Picked in the field this morning. 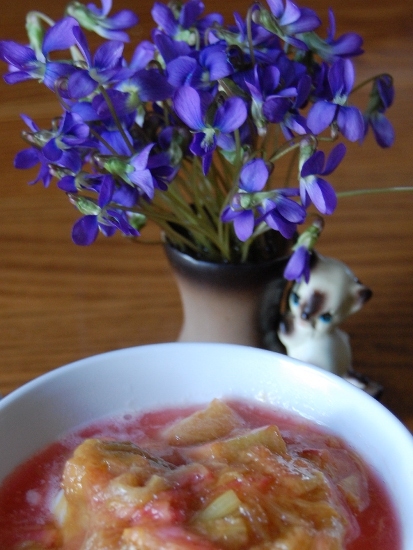 And the first rhubarb was cooked with honey and served over yogurt for breakfast. The mocking bird is singing each morning as I go up the lane. I try to pick out all the different bird songs he is copying. The field out east is all fitted now. Jay thinks corn will be planted there. At 50 and sunny it feels like a true spring day today. He mowed both our lawn and the neighbor’s yesterday for the first time this year with his new mower. I prefer letting the grass grow long . Went with Amy this week to see the new Jane Eyre movie. It was the second time for me. I really like the book. Interiors were filmed using natural light or light available at the time so the atmosphere is dark; marvelous costumes. It fulfills admirably the Gothic fiction “quest for atmosphere”: indeed I think the director chose to use the Gothic novel as a theme for the whole movie. At one point one of St.Johns sister’s even references a popular Gothic novel of the day when speaking to Jane about how she was found on their doorstep half dead. Flashbacks are used to tell most of the story. St. John Rivers and his sisters are not related to Jane, the ending is premature. People and large scenic chunks have had to be removed to make a movie of the ‘proper’ length. One of the main themes of Bronte’s book is investigating how individuals interpret Christianity in living their lives; whether (wrongly) used as a tool, as a means to serve a (sometimes) immoral ends (personal power or glory), or is rightly understood as relationship with and service to God. This theme is ignored in this movie. Since one must assume given the time period that all persons are Christian, most are portrayed as wicked, stupid, self-centered, or immoral. I especially disliked the twist the director gave to the character of St.John Rivers. God’s name is invoked once only–and it seems out of place since no relationship with him was evident prior to this moment. There is morality, yes. There is talk of spirits and spiritual things, yes. That talk of spiritual connection, of relationships that ignore our fleshy house, is the strength of this movie. It makes it worth seeing and thinking about. And the costumes.